I didn’t keep up with reporting on my concert going this past fall, but here is a first attempt to catch up with a few thoughts about some performances in the last several months. – 11/8/17: Margaret Leng Tan at the Barnes Foundation. 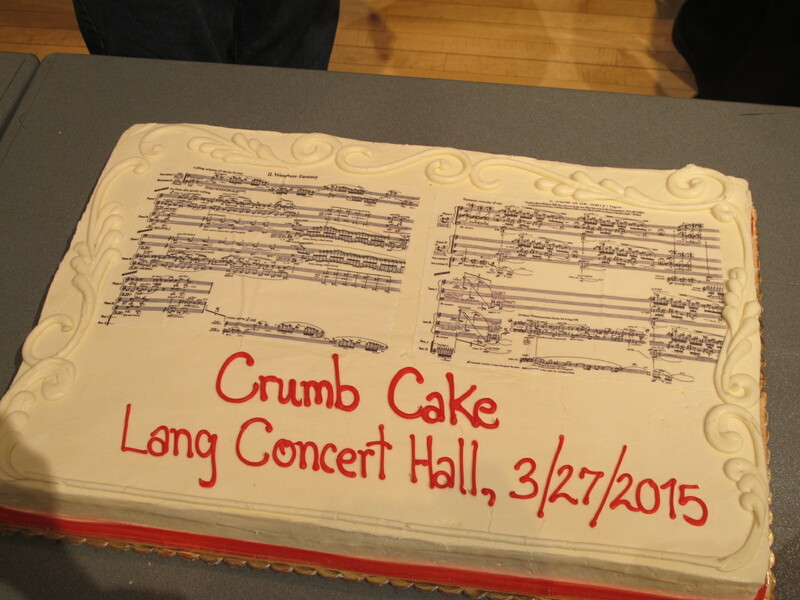 The big news here was the substantial new set of piano pieces by George Crumb called Metamorphoses. Modeled after Pictures at an Exhibition, the ten movements were suggested by various paintings, including works by Klee, van Gogh, Chagall, Kandinsky, and others. (It’s not the first time Crumb’s music was inspired by visual media as his A Little Suite for Christmas, A. D. 1979 was suggested by frescoes in the Arena Chapel.) While the new work doesn’t break ground stylistically, the piece embodied all the attributes we associate with this master: beautifully integrated extended piano techniques at the service of highly characterized expression; exquisite timbral sensitivity; faultless timing. 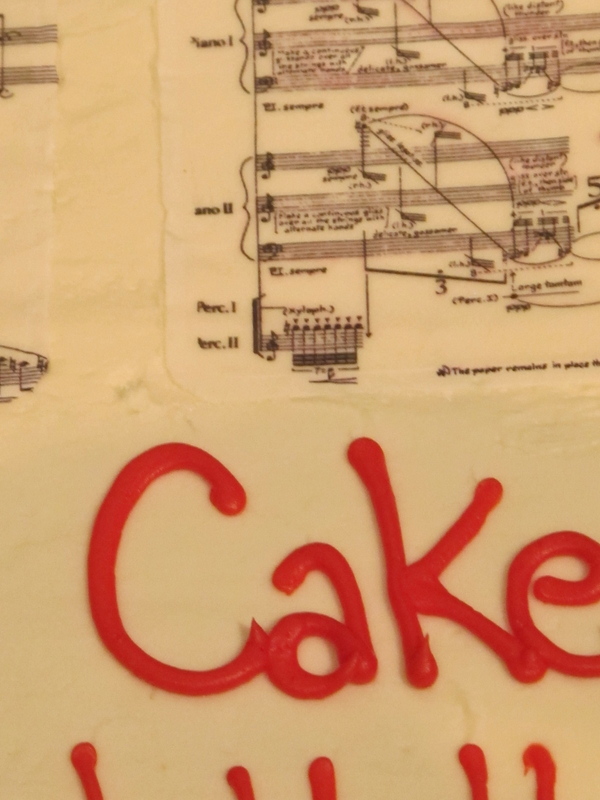 Crumb returned to the theatrical use of the pianist’s voice in this work, and included a part for toy piano, a specialty of Ms. Tan. While Margaret Leng Tan is an admirable artist, I can imagine an even more vividly compelling performance of the work with a greater dynamic range. George’s music needs to be larger than life, and that wasn’t always the case here. Perhaps the vast space in which musical performances at The Barnes take place played a role; perhaps the amplification of the piano needed to be more powerful. The magical spell cast by George’s music was impaired by the lengthy pauses between movements. Part of what makes the first two books of George’s Makrokosmos such an intense listening experience is that the dramatic tension is maintained throughout the entire piece. 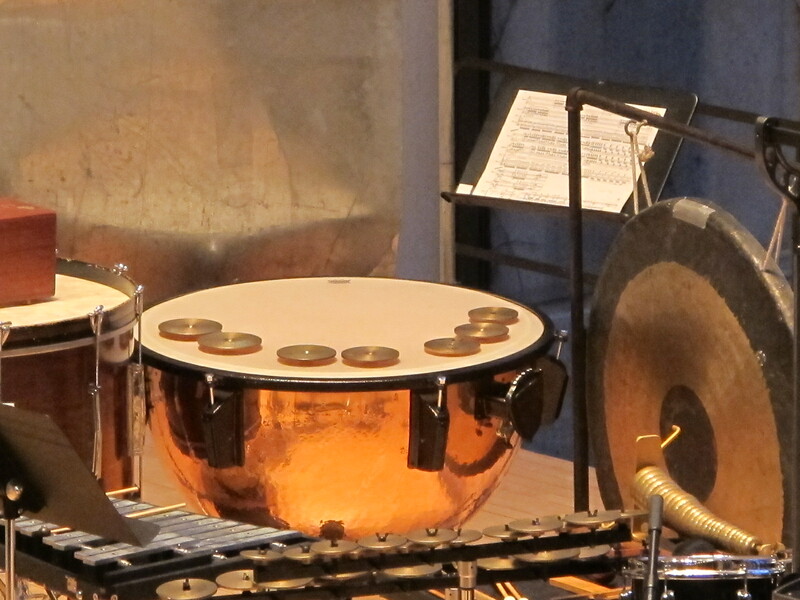 While it may be that George does not request the movements of Metamophoses to be played attacca, as is the case with the Makrokosmos sets, (I have not seen the score) it should still be possible to hold the listener in the aura of the work’s “otherworldly resonances” (to borrow the title of another work by George.) Helpfully, the Barnes briefly projected slides of the relevant paintings before each movement, but inexplicably replaced them with works by another artist that only vaguely related to the moods of George’s piece, leaving those images projected while the piece was being played. The Crumb work was preceded by one of Cage’s more boring prepared piano pieces and a few of Cowell’s pioneering works, with The Banshee standing out for its moody atmosphere. – lastly, here’s my annual reminder to keep up your musicianship skills during Christmastime. I just got in from the Orchestra 2001 performance of George Crumb’s Music for a Summer Evening. 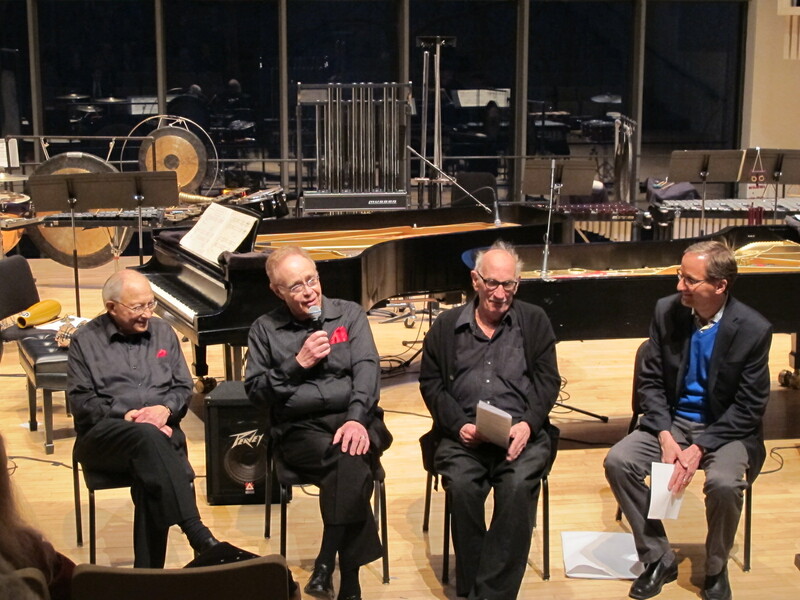 Nearly 41 years ago to the day, James Freeman, Gilbert Kalish, Richard Fitz and Ray DesRoches gave the first performance of the piece for the opening of Lang Hall at Swarthmore College, and tonight Freeman and Kalish were reunited to perform the work, alongside percussionists William Kerrigan and David Nelson. This is one of Crumb’s most successful pieces in which the expanded piano idiom he developed in the two books of Makrokosmos solo pieces is utilized for a work of epic scale. The finale of the piece, “Music of the Starry Night”, is deeply moving, orchestral in conception and dazzling at its climax with ecstatic layerings of ringing sound. The performance was very fine, as one would expect from these musicians, though I wish the piano amplification was stronger. After the last quiet notes died away, the members of the ensemble and the audience kept silent for a remarkably long time – no one wanted the moment to end. Finally some called out “Bravo” and we were released back into daily life. It’s certainly not summer here in Philadelphia, in fact it barely feels like spring. 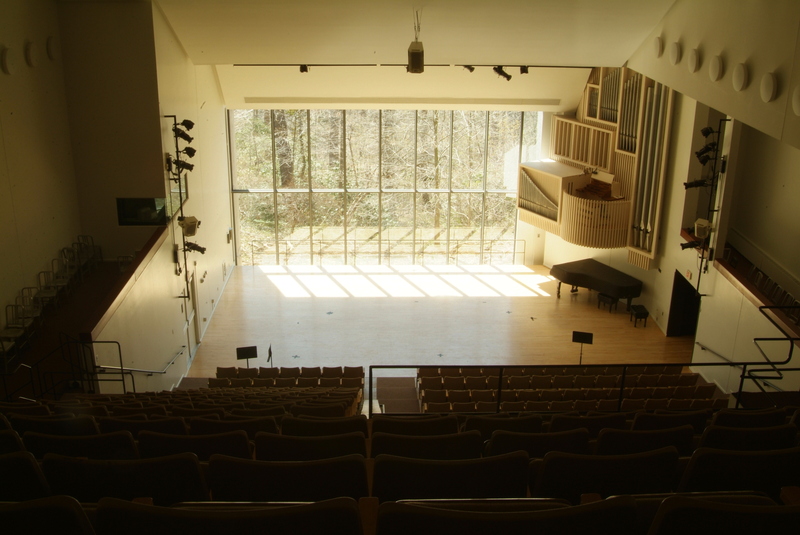 But there will be Music for a Summer Evening tomorrow night at Swarthmore College. 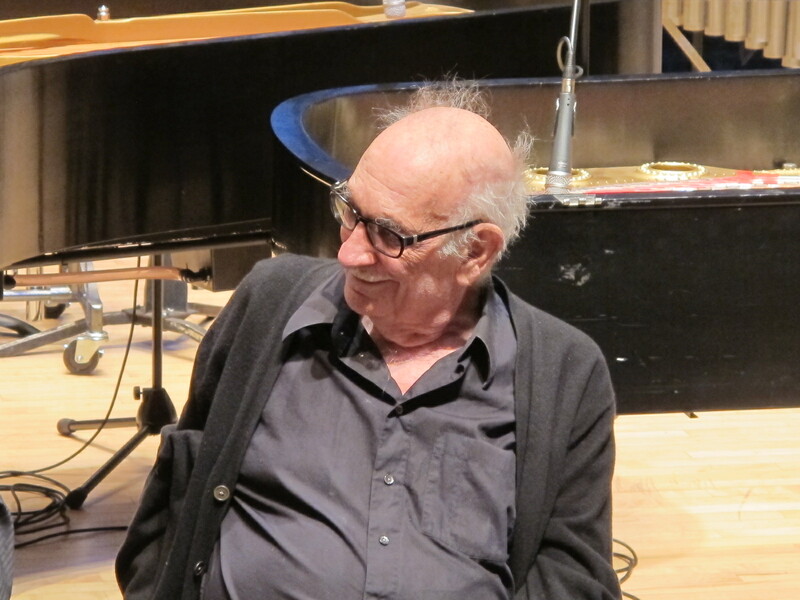 I’m referring to the work by George Crumb for two pianos and percussion that will be played on an Orchestra 2001 concert tomorrow night, March 27. There will be a pre-concert chat with Stephen Bruns from the University of Colorado, a leading scholar on George’s music, at 7:30 pm, with the concert at 8:00 and a party on the stage of Lang Concert Hall to follow. 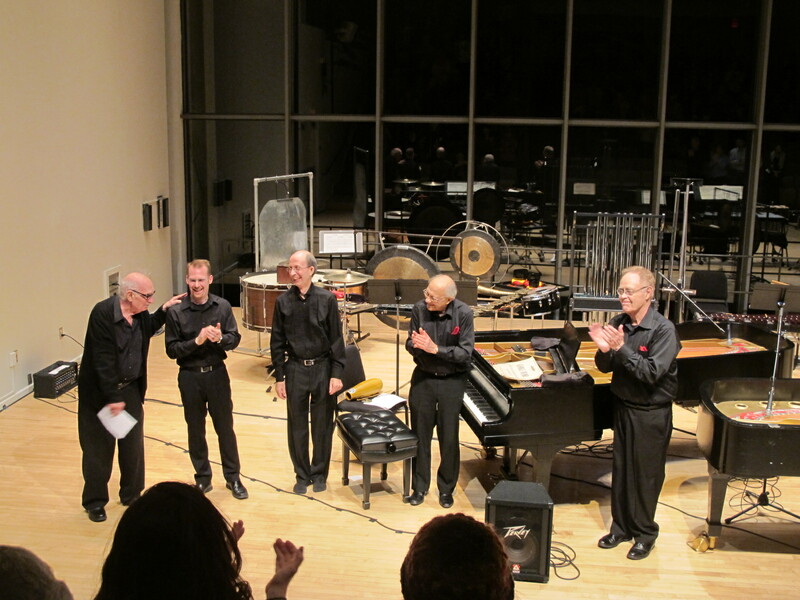 There are several reasons to celebrate: it’s a slightly late birthday party for George Crumb at 85; it’s the end of James Freeman’s 27 years as Artistic Director of Orchestra 2001; and it is 41 years since the premiere of Music for a Summer Evening, written for the opening of Lang Concert Hall, pictured at left. 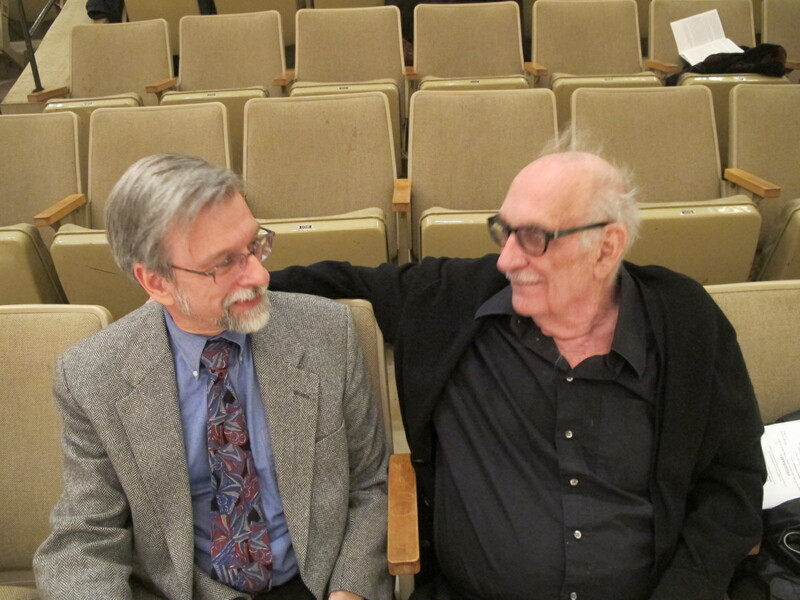 Not only will the piece be played in the hall where it was first heard; remarkably, the pianists will be the same two artists who gave the premiere: James Freeman and Gilbert Kalish. William Kerrigan and David Nelson will be the percussionists tomorrow evening; the original percussionists were Raymond DesRoches and Richard Fitz. All four of the first performers recorded the work for Nonesuch in the Teresa Sterne era; that recording is still available as a reissue from Arkiv Music, on a disc with the incomparable Jan DeGaetani’s performance of George’s Ancient Voices of Children. I rate Crumb very highly in the canon of American music, and Music for a Summer Evening belongs near the top of his catalog. 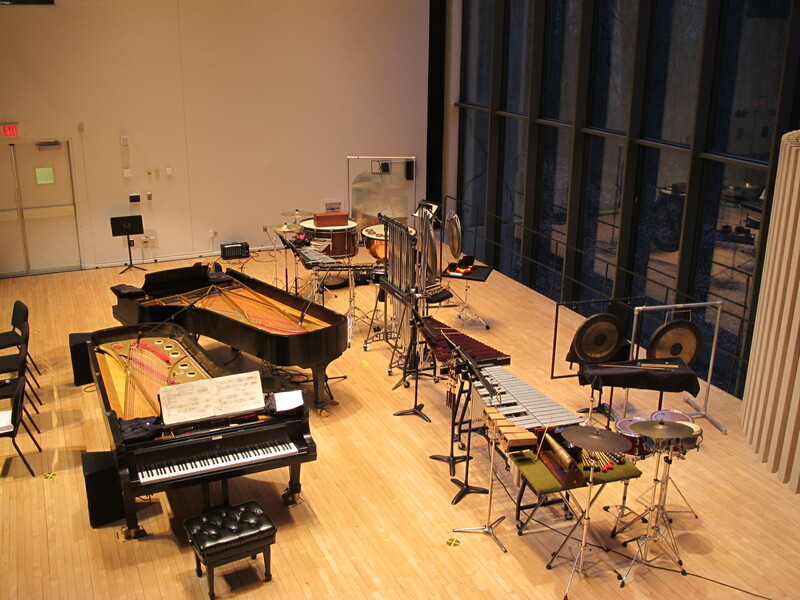 It’s a big piece – about 40 minutes, scored for two amplified pianos and an extensive array of percussion. The amplification serves to help project the delicate piano sounds derived from the extended performances techniques – pizzicato, muted notes, and so forth – as well as create a larger-than-life sound image. Crumb’s first two books of Makrokosmos explore extended techniques for solo piano, but the additional instrumental resources of this third volume in the series (the work is subtitled Makrokosmos III) permit a more orchestral conception (the climaxes in this music are assuredly cosmic in their dimensions!) that points toward the piano plus four percussionist instrumentation for George’s much later American Songbook series, which arrange folk and traditional melodies. In fact, the March 27 concert will be followed by another Orchestra 2001 program on March 29 featuring Voices from the Morning of the Earth, the sixth in that Songbook set. The composer’s daughter Ann Crumb, soprano, and Randall Scarlata, baritone, will be the soloists. The program on the 29th is at the Curtis Institute at 8:00 pm. It’s been my privilege to play George’s music on many occasions, including Music for a Summer Evening, in a performance led by veteran (now retired) Philadelphia Orchestra percussionist Alan Abel. 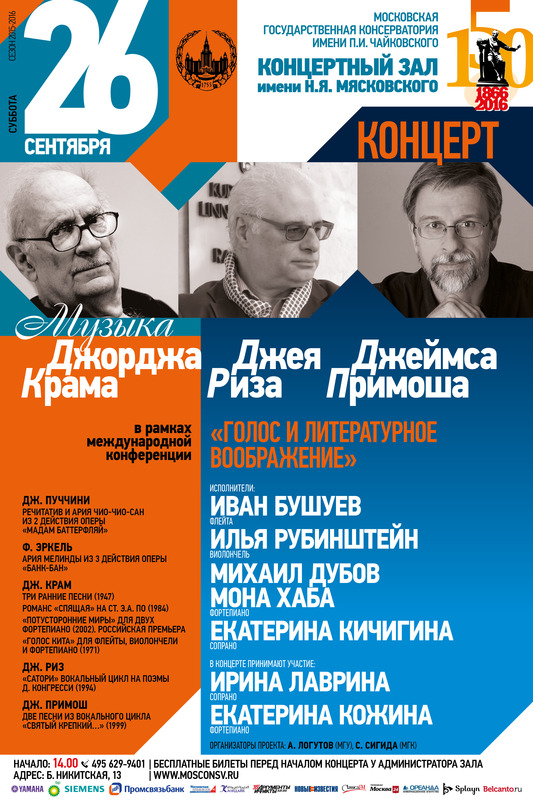 I’ve played Makrokosmos I numerous times, notably at the Gaudeamus Interpreters Competition in 1977, and repeatedly performed Celestial Mechanics (Makrokosmos IV) with pianist Lambert Orkis. We subsequently recorded the piece. 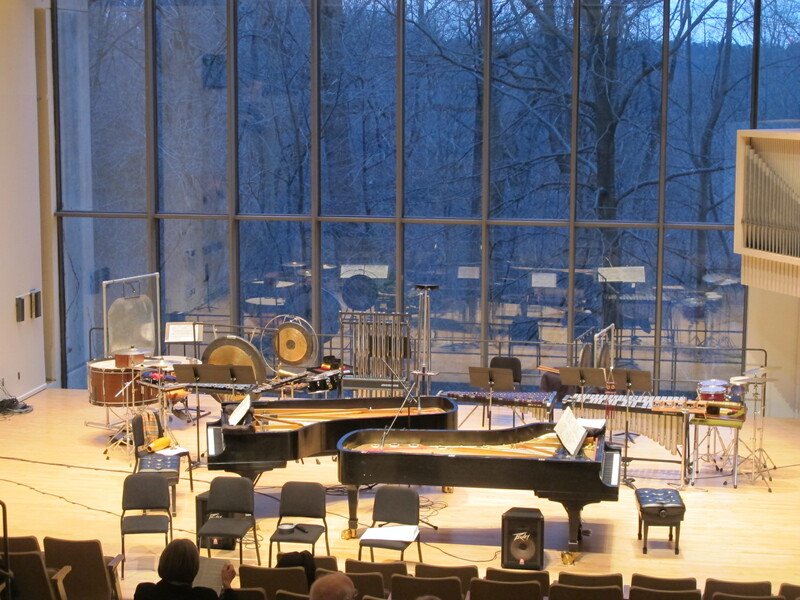 Most recently, I played A Little Suite for Christmas, A.D. 1979 at a Penn concert last year. While extended piano techniques have been commonly used for decades now, nobody has used them better than George. But it is not just the successful integration of those extended techniques that make George’s large body of music for piano significant; the conventional keyboard writing is no less poetic. This is music of extraordinary imagination and meticulous craft, speaking to listeners with unusually powerful expressive intensity. There is much here for which we should be grateful, as pianists, as listeners. Thank you, George. Note: this WordPress design I switched to a while ago is great, but it is easy to overlook when comments have been posted on a blog entry – check the comments below (click on the word “comments” after the list of tags) for more about playing Crumb’s piano music. How do you write Primosch in Cyrillic characters? 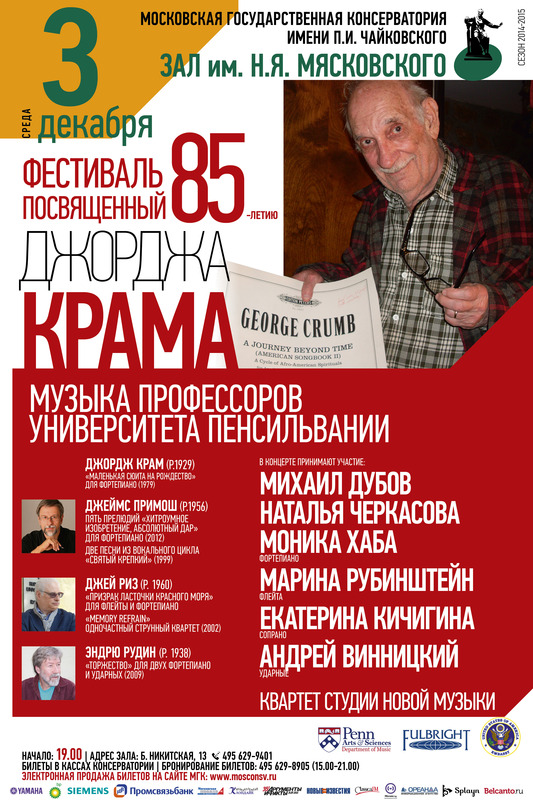 Here’s the poster for this week’s concert at the Moscow Conservatory featuring music by George Crumb, Jay Reise, Andrew Rudin, and myself. Details here. It is a curious thing to see one’s name and the titles of one’s pieces written in not just a foreign language, but in characters that are unintelligible to me. 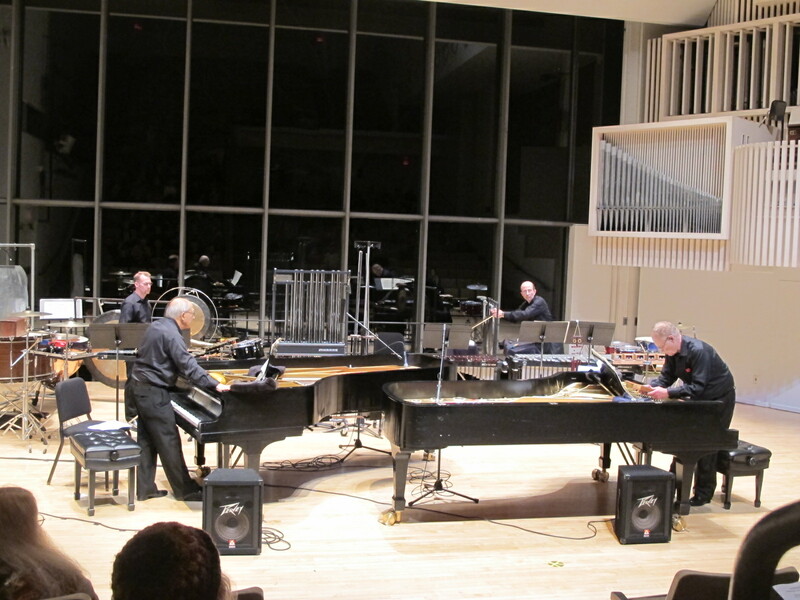 I enjoyed this article from a few years ago by Blair Johnston discussing George Crumb’s Black Angels, performed by the Daedalus Quartet at Penn last week.